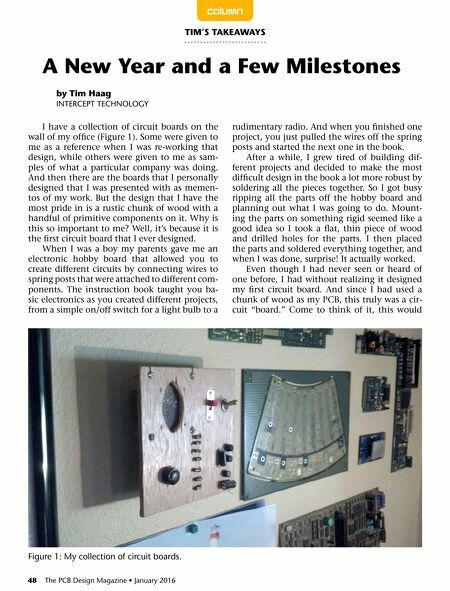 48 The PCB Design Magazine • January 2016 column by Tim Haag InTerCePT TeCHnology TIM'S TAkEAWAYS A New Year and a Few Milestones I have a collection of circuit boards on the wall of my office (Figure 1). Some were given to me as a reference when I was re-working that design, while others were given to me as sam- ples of what a particular company was doing. 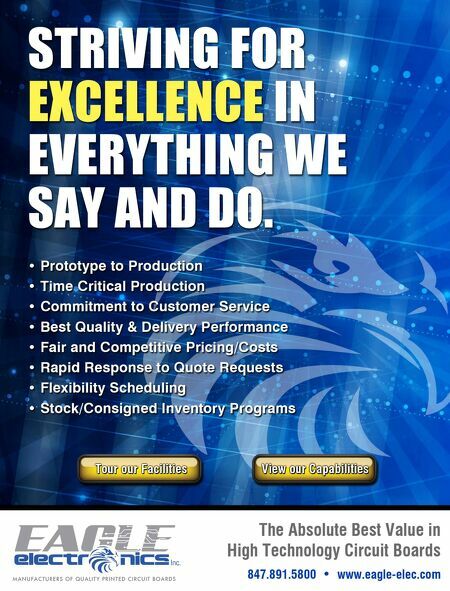 And then there are the boards that I personally designed that I was presented with as memen- tos of my work. But the design that I have the most pride in is a rustic chunk of wood with a handful of primitive components on it. Why is this so important to me? Well, it's because it is the first circuit board that I ever designed. When I was a boy my parents gave me an electronic hobby board that allowed you to create different circuits by connecting wires to spring posts that were attached to different com- ponents. The instruction book taught you ba- sic electronics as you created different projects, from a simple on/off switch for a light bulb to a rudimentary radio. And when you finished one project, you just pulled the wires off the spring posts and started the next one in the book. After a while, I grew tired of building dif- ferent projects and decided to make the most difficult design in the book a lot more robust by soldering all the pieces together. So I got busy ripping all the parts off the hobby board and planning out what I was going to do. Mount- ing the parts on something rigid seemed like a good idea so I took a flat, thin piece of wood and drilled holes for the parts. I then placed the parts and soldered everything together, and when I was done, surprise! It actually worked. Even though I had never seen or heard of one before, I had without realizing it designed my first circuit board. And since I had used a chunk of wood as my PCB, this truly was a cir- cuit "board." Come to think of it, this would Figure 1: My collection of circuit boards.